Skyler Fitzmaurice is studying abroad in Sogndal, Norway. Skyler Fitzmaurice, son of Peter Fitzmaurice and Shannon Skibeness, is on what could be an adventure of a lifetime. 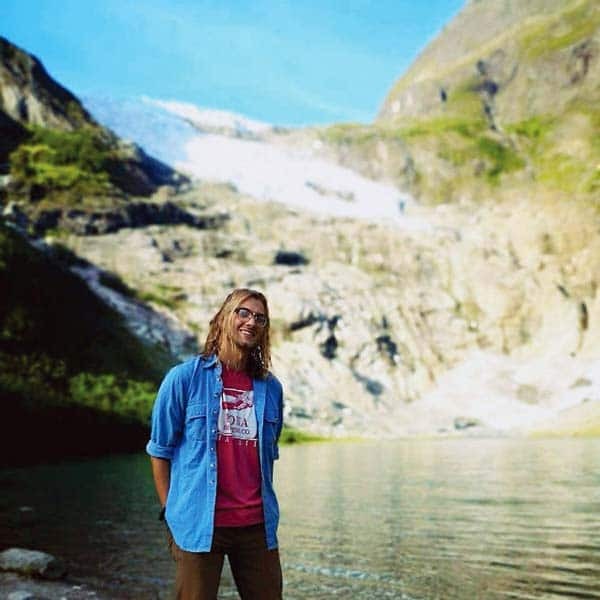 Skyler, a junior at Western Washington University, is enrolled fall semester in Sogndal, Norway, at Høgskulen på Vestlandet, or in English, Western Norway University of Applied Sciences. His major at WWU is outdoor recreation. The program in Norway that he is enrolled in is a recreation program for international students. The classes are taught in English, but he lives in a dorm on campus with Norwegian students. The program, which he earns college credit for, has eight expeditions that Skyler will participate in, including backpacking, sea kayaking and skiing. 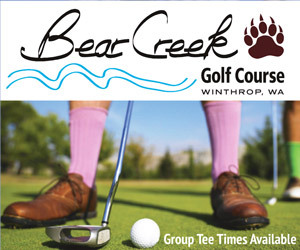 Norwegians, like many in the Methow, take outdoor recreation seriously, and it is an integral part of their lives. This specialized program for international students to learn from Norwegian professors, experts on the importance of recreation, is the outpouring of the Norwegian people’s heart-felt life philosophy. Will Skyler have a chance meet up with Walker Hall, who is also spending some time abroad in Norway? Perhaps one snowy evening in a cozy fondue restaurant, the two Mazamans will find themselves bumping into each other. Stranger things have happened. The next time you are on the nearly-famous Tawlks-Foster Suspension Bridge, you may find more sway in your crossing. 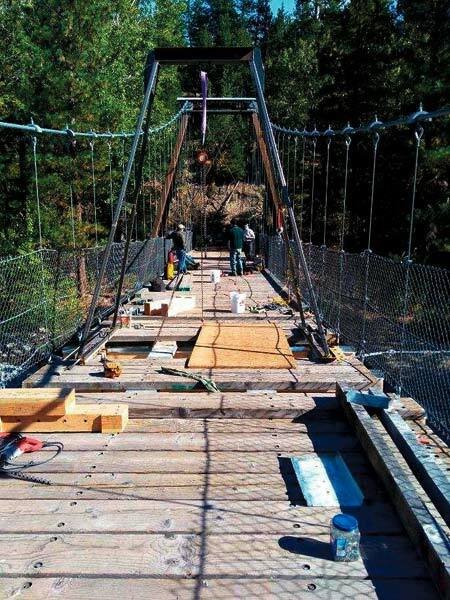 The good people of Methow Trails have been working on the bridge for nearly a month, doing some maintenance that includes replacing cross beams that support the decking, as well as loosening the cables a bit in order to get the bridge swinging a little more than it used to. Volunteers, as always, are making this project happen. My source, Nicole McCullough, tells me that along with Jon, Michael and Brandon of Methow Trails, there are usually one or two volunteers a day. While I do not have all of their names in order to give proper recognition, I’m sure they are not helping out for fame and fortune. Instead, they can take payment in every child’s smile and laugh that comes with crossing that bridge. I know that there have been many and will be many more to come. Do cows smile when they cross the suspension bridge? Do cows even cross the bridge? Cows are surprising. Especially the free range cattle that we have been seeing in and around the Mazama area lately. From the cows that have been spotted on the Lost River Airstrip, to the cows blocking Lost River Road, to the ones as far down as Highway 20 at West Boesel, these bovine are showing up in the least expected areas. According to part-time resident Craig McDonald, as well as demonstrated by the hideous bloodstain on the road, one of these cows was hit on the highway last week. The incident took place near Bob and Gloria Spiwak’s place. Craig, who lives in the valley from April until November, tells me, “It was unfortunately a small car, but lucky for the driver it was a young cow — although the whole event was even more unfortunate for the cow.” Moral of the story? Be careful out there. Finally, please note that the Mazama Yard Sale has a new date. Scratch Oct. 6, and write in Oct. 13 on your calendars. If you would like to sell your castoff treasures in this sale of all sales, please contact Lisa Northey by email at lisanorthey@gmail.com. Volunteers gave the Tawlks-Foster Suspension Bridge a facelift.